Tofua is a remote volcano in Tonga that is not monitored. The primary sources of information about the volcano's activity are from infrequent field visits, ash advisories from the Wellington Volcanic Ash Advisory Centre, and MODIS thermal sensors aboard the Aqua and Terra satellites. No ash advisories from the Wellington Volcanic Ash Advisory Centre were issued during the reporting period, 28 September 2013-30 June 2015. Since the last report through 27 September 2013 (BGVN 38:07), five thermal alerts were recorded through 30 June 2015 (table 3). Two of those alerts, on 14 and 23 September 2014, were located outside and NW of the caldera rim and therefore were probably not associated with volcanic activity. No thermal alerts were issued between 18 October 2014 and 30 June 2015. Table 3. Thermal alerts between 28 September 2013 and 30 June 2015. Thermal alerts are derived from data collected by the MODIS thermal sensors aboard the Aqua and Terra satellites and processed by the Hawaii Institute of Geophysics and Planetology using the MODVOLC algorithm. Courtesy of Hawaii Institute of Geophysics and Planetology. Several articles on Tofua's volcanic geology and geochemistry published in the past few years have come to our attention (Caulfield, 2011, 2012, 2015). Caulfield and others (2011, 2012) include helpful aerial and cross-section sketches of the volcano's various geologic features. References: Caulfield, J. T., Cronin, S.J., Turner, S.P., & Cooper, L.B., 2011, Mafic Plinian volcanism and ignimbrite emplacement at Tofua volcano, Tonga, Bull. Volcanology, v. 73, pp.1259–1277. Caulfield, J. T., Turner, S. P., Smith, I. E. M., Cooper, L. B., & Jenner, G. A., 2012, Magma evolution in the primitive, intra-oceanic Tonga arc: petrogenesis of basaltic andesites at Tofua volcano. Journal of Petrology, v. 53(6), pp. 1197-1230. Caulfield, J. T., Blichert-Toft, J., Albarède, F., & Turner, S. P., 2015, Corrigendum to 'Magma Evolution in the Primitive, Intra-oceanic Tonga Arc: Petrogenesis of Basaltic Andesites at Tofua Volcano'and 'Magma Evolution in the Primitive, Intra-oceanic Tonga Arc: Rapid Petrogenesis of Dacites at Fonualei Volcano, Journal of Petrology, v. 56(3), pp. 641-644. Information Contacts: Hawai'i Institute of Geophysics and Planetology (HIGP), MODVOLC Thermal Alerts System, School of Ocean and Earth Science and Technology (SOEST), Univ. of Hawai'i, 2525 Correa Road, Honolulu, HI 96822, USA (URL: http://modis.higp.hawaii.edu/). A message received from the ship MV Marama at 1445 on 31 May stated that the W side of frequently active Tofua . . . was emitting smoke, but that no activity was visible on Late. Information Contacts: R. Richmond, Mineral Resources Dept., Fiji; J. Latter, DSIR, Wellington; S. Tongilava, Lands Survey and Natural Resources, Tonga; R. Jones, Air Tonga. Most of the reported eruption sites were investigated during the 11-18 July cruise of the Fijian research vessel RV Bulikula.... Large fluctuations in the intensity of fumarolic activity were observed at both Fonualei and Tofua. 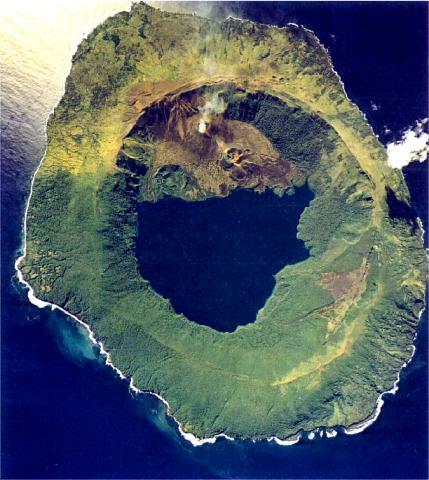 On 1 August 2000, Jeff and Raine Williams, aboard the sailing yacht Gryphon, reported that they spent a couple nights at Uanukuhahaki island, approximately 48 km E of the volcanic islands of Kao and Tofua. They noted that "steam can be seen rising from Tofua almost continuously." They also observed that pumice stones were scattered all along the beach at Uanukuhahaki. Tim Worthington (Christian-Albrechts-Universität zu Kiel) notes that the activity seen on 1 August 2000 is the normal state of Tofua. In September 1999, Worthington mapped a thick compound ash layer (with three distinct units) containing abundant pumice clasts that is widespread on Kotu, Ha'afeva, Matuku, and other islands in the group 30-50 km E of Tofua and Kao. The ash represents the distal part of the pyroclastic flow sequence associated with a pre-historic caldera-forming eruption on Tofua. Other workers, including Shane Cronin (GEOMAR), are looking at these units in more detail with a view to dating the eruption. The "pumice stones" seen on Uanukuhahaki may be blocks of andesitic pumice eroded from this ash sequence. Geologic mapping and observations, November 2000. Worthington was part of a group that spent 8 days mapping and sampling at Tofua in late November 2000. 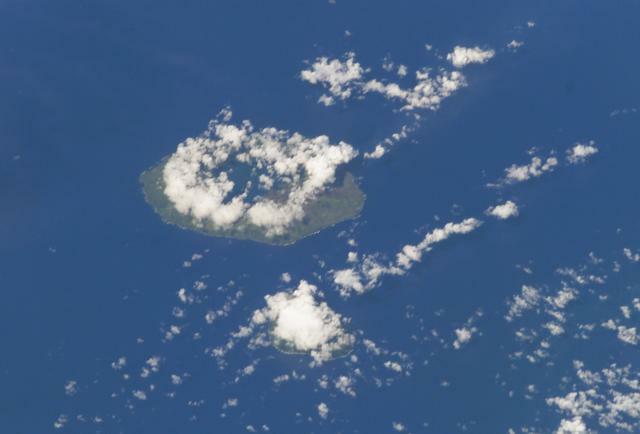 Tofua is a nearly circular island 9.5 x 7.1 km in diameter. The flanks rise steeply to a well-defined caldera rim reaching 515 m elevation in the NW and SE. The inner caldera walls are precipitous, and the caldera is occupied by a large, cold, fresh-water lake standing at 30 m elevation. The most recent volcanism took place from vents within the N half of the caldera, where there are three cinder-cone complexes. The westernmost cinder-cone complex is densely forested and rather degraded. The easternmost complex consists of four distinct but intergrown small cinder cones with well-formed craters (two have sub-craters). A series of young rubble-topped basaltic andesite lavas were erupted from these cones and flowed towards (and into) the lake. Different degrees of vegetation on each flow suggest a recurrence interval of about 50 years, and the youngest may have been emplaced during the 1958-60 eruptions. It was mapped by visiting geologists in the early 1970s. The northernmost cinder cone is the large and vigorously degassing Lofia, with a basal diameter of ~500 m and a summit at 380 m elevation. Lofia has a summit crater 70 m in diameter with vertical inner walls, which was completely filled by dense brownish-blue SO2-rich steam during the visit. Intermittent chugging sounds resembling a train starting to move could be heard from the crater rim. From the yacht, occasional dull orange reflections were observed in clouds above the caldera rim on two nights. However, there was no evidence of recent spatter around the crater rim, nor any indication of significant volcanic activity since the 1958-60 eruptions. On calm days the plume from Lofia rose above the caldera rim and was visible from nearby islands and to passing ships; more commonly it dispersed in the wind before passing the caldera rim. Numerous breadcrust bombs were plastered onto the NW caldera wall downwind from Lofia, and had welded to form a sparsely vegetated 20-m-thick rootless lava flow on the NW caldera rim. The region of sparse vegetation on the outer NW caldera wall extended from 300 to 515 m elevation, gaving the NW summit of Tofua a "burnt" appearance to passing ships. The spatter testifies to vigorous fire-fountaining at Lofia, whose summit is 130 m below and 700 m S of the caldera rim. The latest episode of this activity may have taken place during the 1958-60 eruptions, but the spatter almost certainly represents the accumulated result of many such episodes. Information Contacts: Tim J. Worthington, Institut für Geowissenschaften, Christian-Albrechts-Universität zu Kiel, Olshausenstr. 40, D-24118 Kiel, Germany; Jeff and Raine Williams, P.O. Box 729, Funkstown, MD 21734, USA. Fieldwork at Tofua during 11 May-1 June 2006 was accomplished by a group led by John Caulfield (Macquarie University). The work involved detailed lithological mapping of the island, with specific focus on the N side. It is hoped that correlation of geological units and U-Series disequilibria will help to unravel the eruptive history. The active vent, Lofia, was degassing throughout the visit. Fumaroles were located at the bottom of the vent and on the lower half of the inside of the vent. There was no degassing on the flanks of Lofia. Expelled gases were brownish-blue, with a strong sulfurous smell. The "chugging" sounds reported by Tim Worthington (BGVN 26:12) were still occurring at a rate of once every few minutes to bursts of up to four, one after the other. The highest point on the rim of Lofia was very unstable, probably weakened by the large earthquake that occurred on 4 May. A large crack (~ 30 cm wide), trending roughly WNW-ESE had opened across the thick ash and spatter deposits in the caldera, several hundred meters N of Lofia. When the gas was periodically cleared by wind gusts, three craters could be seen at the bottom of the 150-200-m-deep vent. Of these craters, one was fumarolic, one was quiet, and one contained an orange glow. Although the depth and angle of the vent meant that the magma itself was not visible, the strong glow suggested that lava had ponded there. There was abundant spatter around the rim and abundant bombs on the flanks, the latter most likely resulting from eruptive activity in 1958. The pH of the large crater lake was determined to be 5.5-6. Information Contacts: John Caulfield and Heather Cunningham, ARC National Key Centre for Geochemical Evolution and Metallogeny of Continents (GEMOC), Department of Earth & Planetary Sciences, Macquarie University, NSW 2109, Australia (URL: http://gemoc.mq.edu.au/); Graham Smith, Department of Earth Sciences, University of Cambridge, Downing Street, Cambridge CB2 3EQ,United Kingdom. An increased number of satellite-based MODVOLC thermal alerts occurred at Tofua (figure 1) on nine days during March to November 2008, as compared with alerts on three days in 2004, none in 2005 or 2006, two days in 2007, and one day in 2009 (as of 5 April). All of these infrared-derived alerts have been in the same area, a zone several kilometers N of the lake near the 5-km-diameter caldera's N rim, a region where numerous cones and craters reside. One or more of those cones was steaming in a 1990 image. In that image, this area appears steep and largely rocky, an unlikely location for repeated fires (figure 2). Eyewitness views of glow, scoria and spatter ejections from in the crater of Lofia cone during 1993, 2004, and 2009 suggest that at least some if not all the MODVOLC alerts are credible signatures reflecting the minimum level of volcanism at Tofua. Figure 1. A set of index maps and a larger map of the main part of the Tonga Archipelago. The latter shows the location of Tofua Island in the western part of the Ha'apai Island Group. From Bauer (1970). Figure 2. Aerial photograph of Tofua volcano showing the steaming Lofia cinder cone. Courtesy of the Tonga Ministry of Lands, Survey, and Natural Resources, 1990 (published in Taylor and Ewart, 1997). Previous reports in the Bulletin on Tofua covered aspects of activity during portions of 1979, 2000, and 2006 (SEAN 04:06, 04:12; BGVN 26:12, and 31:06, respectively). Taylor and Ewart (1997) compiled a chronology of Tongan eruptions. Observations during 1993. Mary Lyn Fonua sent the following summary regarding a visit to Tofua in 1993. "It was quite a long time ago that we did a photographic feature on Tofua in May 1993 for our Eva magazine. Pesi, my husband, went there on [29 April 1993] on a two seater amphibian aircraft piloted by Peter Goldstern that landed on the crater lake. There was a smoking vent on the side of the volcano and thick yellowish smoke pouring out of the wall of the crater. They felt the island rumbling. There were hot thermal pools to bathe in. I seem to remember Pesi saying that ... it was possible to see a glow from volcanic activity in the crater at night. About 10 people were living on the island at the time, on the southern tip of the island .... There was forest and scrub on some parts of the island." The above description of visible glow presumably came from the Lofia vent area just N of the lake. Vegetation and permanent or itinerant inhabitants suggests that some of the outlying thermal alerts discussed below might have been false-positives due to fires. Nicole Keller, of Woods Hole Oceanographic Institution, also notes that Tongans often communicate from island to island using fires. Observations during 2004. Nicole Keller sent the following information about her October 2004 visit. "The only fumaroles were located inside Lofia crater?not at all accessible. None of the other, smaller cones around Lofia were active in any way (no obvious signs of degassing, no sulfur smell), but definitely had some alteration features that suggest they were hydrothermally altered in the past. Every few minutes there was a rumbling, and every now and again (1-time to 2-times per hour) there was a bigger explosion projecting juvenile scoria over the crater rim." Similar activity was seen by John Caulfield in May 2006 (BGVN 31:06), but without the scoria showers. MODVOLC Thermal Alerts, 2004-2009. Satellite thermal data over Tofua revealed the absence of thermal alerts between 30 May 2004 and 18 March 2007. The MODVOLC alerts mentioned above began 19 March 2004 (table 1 and figure 3). The maps reveal repeating alerts at and adjacent to the N-caldera cone (Lofia). The October 2004 in situ observations from Keller confirm that the 19 March and 10 and 29 May 2004 MODVOLC alerts were probably due to volcanism. Given the pattern of small ongoing eruptions from a deep crater at Lofia as discussed by visitors during 1993, 2004, and at some point during 2008-2009, it is likely most of the MODVOLC alerts reflect volcanism at Tofua. Figure 3. Graphic depiction (by year) of satellite thermal alerts (MODVOLC) for Tofua volcano from 19 March 2004 through 6 April 2009. No alerts were measured between 30 May 2004 and 14 March 2007. Images show alerts during 2004, 2007, 2008, and 2009. Courtesy of HIGP Thermal Alerts System. Table 1. Satellite thermal alerts (MODVOLC) for Tofua volcano from 19 March 2004 through 6 April 2009. No alerts were measured between 30 May 2004 and 14 March 2007. Courtesy of HIGP Thermal Alerts System. The HIGP Thermal Alerts System listed approximately 190 pixels ~ 45 km SE of Tofua Island on 17 January 2009. Rob Wright of the MODIS/MODVOLC team explained that these were artifacts over the ocean due to reflected sunlight (see http://modis.higp.hawaii.edu/daytime.html). "The last field in the MODVOLC text alert file is a sunglint vector. When this number is over 12 degrees it means that the MODIS sensor was 'looking' within 12 degrees of the specular angle (like being blinded by a mirror when the sun-mirror-eye angle is just right). In this case the mirror is the water surface. We leave them off the map because they are not real hot-spots. We leave them in the text alert file because our 12 degree threshold errs on the side of caution, and other workers may want to use a less restrictive threshold." On the date in question the glint vector was between 1 and 3. Observations during March 2009. Swiss adventurer Xavier Rosset reported a clear description of minor eruptive activity at Tofua. His audio dialog, posted 13 March 2009, referred to his visit to the active cone during the preceding week, although the exact date of observation was unclear. At that time the crater was about 80-100 m deep and the same in diameter. Three openings of undetermined size displayed an orange glow. Lava ejections from these vents rose 10-50 m high and were accompanied by loud noises. Photos taken by Rosset (figures 4 and 5) show the active cone with lava in the bottom. Rosset's 27 March 2009 dialog discusses a strong earthquake in the region (Mw 7.6 on 20 March, centered ~ 45 km SE of Tofua), which caused several rockfalls on the island. He visited the volcano in the afternoon and, looking into the active crater, saw few noticeable changes. Figure 4. Photo of Xavier Rosset in front of the active Lofia cinder cone at Tofua, March 2009. The caldera lake resides in the background. Courtesy of X. Rosset. Figure 5. Photo looking down into the vertical-walled Lofia crater to an orange-colored, circular zone of lava on the floor, March 2009. Courtesy of X. Rosset. References. Bauer, G.R., 1970, The Geology of Tofua Island, Tonga: Pacific Science, v. 24, no. 3, p. 333-350. Morrison, C., 29 May 2008, Xavier Rosset, 300 days alone on an island: The Islomaniac website (http://www.the-islomaniac.com/). Taylor, P.W., and Ewart, A., 1997, The Tofua Volcanic Arc, Tonga, SW Pacific: a review of historic volcanic activity: Aust Volc Invest Occ Rpt, 97/01, 58 p.
Information Contacts: Hawai'i Institute of Geophysics and Planetology (HIGP) Thermal Alerts System, School of Ocean and Earth Science and Technology (SOEST), Univ. of Hawai'i, 2525 Correa Road, Honolulu, HI 96822, USA (URL: http://modis.higp.hawaii.edu/); Mary Lyn Fonua, Matangi Tonga Online, Vava'u Press Ltd., Tonga (URL: http://www.matangitonga.to/); Xavier Rosset (URL: http://www.xavierrosset.com/); Paul W. Taylor, Australian Volcanological Investigations, P.O. Box 291, Pymble, NSW, 2073 Australia; Nicole S. Keller, Department of Geology and Geophysics, Woods Hole Oceanographic Institution, Woods Hole, MA, USA. Tofua is a non-instrumented, remote, island volcano that is seldom the subject of reports; it continued to emit at least low-level eruptions well into 2011. This small volcanic island lies in southern Tonga (see map and other figures in BGVN 34:02), ~ 1,700 km NNE of New Zealand. In 1993 there were ~ 10 residents (BGVN 34:02). Our previous report on Tofua (BGVN 34:02) gave a summary of MODVOLC thermal alert data through March 2009 and discussed data artifacts due to reflected sunlight over the ocean. Since that time, only a single-pixel thermal alert was measured, located at the vent on 4 March 2011. Sailors visit in 2010. On 24 April 2010, sailors in a replica 7.6-m-long wooden boat landed on the island associated with a re-enactment of the landing made by Captain Bligh after he and his crew were cast off of the Bounty in 1789. A number of photos associated with announcements regarding the 2010 landing and activities on Tofua suggests that the volcano was still active in a manner similar to that previously discussed (BGVN 31:06 and 34:02), issuing spatter from a small vent that contained lava (figure 6). Figure 6. Looking into the active crater at Tofua on 24 April 2010 from the crater's N side. The shot emphasizes the crater's sheer walls, ledges draped with ash, and a morphologically complex crater floor covered by black, fresh looking spatter, ash, and possibly lava flows. The scene on the crater floor differs somewhat from the photo made in March 2009 (BGVN 34:02). A large down-dropped zone seems to have developed adjacent (to the right of) the glowing vent. Portions of that lower area emitted gases. As in the 2009 photo, this documents a glowing vent that contains molten lava and the area at the far end of this vent suggest active spattering. Photo by Stuart Kershaw posted by the Tonga Visitors Bureau. Other photos confirmed that, seen from a distance, the active Lofia crater emitted either a substantial white plume or thin gaseous emissions. A down-dropped zone appears to have developed on part of the crater floor between March 2009 and early 2010 (figure 6). The floor itself is not horizontal; much of it slopes at ~45 degrees from the horizontal. The original caption for the photo shown in figure 6 read "Mark Belvedere peers into Tofua's very active volcanic crater." Belvedere (president of the Kalia Foundation, an organization developed to preserve and extend the Polynesian seafaring tradition) participated in events associated with the re-enactment. The sailors traveled on a replica of the boat used by Bligh and the crew members loyal to him. According to the expedition announcements, the re-enactment attempted to make the voyage under similar conditions with the same amount of food and water. The sailors went without charts, additional landfalls, and many modern luxuries. According to news accounts, the 2010 voyage took 7 weeks, ending in Kupang, West Timor. VAAC report in 2011. July reports by the Tonga Meteorological Services and pilot observations described a cloud of unspecified color and dimension from Tofua that rose to an altitude of 1.3 km. This led the Wellington Volcanic Ash Advisory Centre (VAAC) to produce aviation reports (called Volcanic Ash Advisories) starting 13 July 2011. Follow-up reports (without new information) continued until 19 July 2011. Subsequent notices stated that the cloud was not detected in satellite imagery. "When Bligh left the Bounty in the launch, he set course for Tofua, 30 miles away. Its location was marked by a smoke smudge on the skyline issuing from the island's active volcano." That comment indicates the volcano was degassing when seen in 1789, but leaves the issue of the exact eruptive state ambiguous. The earliest witnessed eruption, the 1774 eruption seen by Captain Cook, was judged as explosive (a VEI 2 eruption; Siebert and others, 2010). Siebert, L., Simkin, T., and Kimberly, P., 2010, Volcanoes of the World, 3nd edition: University of California Press and Smithsonian Institution, 568 p.
Tonga Visitors Bureau, 2010, The 'Mutiny on the Bounty' crew visit the volcanic island of Tofua; Tonga Visitors Bureau (Ministry of Tourism), the National Tourist Office (NTO) for the Kingdom of Tonga, URL: http://www.tongaholiday.com/?p=4892; Posted 6 May 2010; accessed August 2011. Information Contacts: Hawai'i Institute of Geophysics and Planetology (HIGP) MODVOLC Thermal Alerts System, School of Ocean and Earth Science and Technology (SOEST), Univ. of Hawai'i, 2525 Correa Road, Honolulu, HI 96822, USA (URL: http://modis.higp.hawaii.edu/); Kalia Foundation USA, 4515 SW Natchez Ct., Tualatin, Oregon 97062 USA; Mark Belvedere, Treasure Island Eueiki Eco Resort, Vava'u, Tonga; Stuart Kershaw, In the Dark Productions company (URL: http://inthedarkproductions.co.uk/); Wellington Volcanic Ash Advisory Center (VAAC), New Zealand (URL: http://vaac.metservice.com/). This report on Tofua elaborates on observations in our previous report (BGVN 36:07). Several maps show Tofua (figure 7) with respect to other geographic features, and also areas of responsibility of Volcanic Ash Advisory Centers in the region. A map of islands in the main part of the Archipelago appeared in BGVN 34:02. Figure 7. (inset at lower right) Tofua shown in geographic context. Tofua is a part of the Kingdom of Tonga. (main map) Various areas of responsibility of Volcanic Ash Advisory Centers (VAACs) in the region; responsibility for Tonga resides with the Wellington Volcanic Ash Advisory Centre. Courtesy of ESRI Corporation (modified). Mark Belvedere (Kalia Foundation) sent additional comments regarding his visit to Tofua on 24 April 2010 (see BGVN 36:07). Belvedere noted that at night as they approached the island the glow from the active crater flickered and was visible ~50 km from the volcano. The glow was absent during the day but a plume was conspicuous. In describing his approach to the crater he stated that "As I was walking up towards [it] the area was littered with lava stone from the sizes of golf balls to beach balls." The observation of those ejecta made him nervous. To him, the crater "looked like an air-breathing red hot lava tube ready to shoot out lava stones at any moment but NO I didn't stay to physically see it shooting out the lava nor the lava stones." Upon reaching the summit the visitors were surprised at how unstable the rim looked. Belvedere had to have his companions hold his feet in order to lean out over the crater to get the photo shown in our previous report (BGVN 36:07). He guessed the distance to the sloping crater floor was on the order of 50 m. The low-level eruptions accompanied larger ash plumes. The plumes were quite reflective at night. A sulfurous odor prevailed. Stuart Kershaw's attempts to create a video with narration on the scene proved difficult because the eruptions were broken with pauses of about 8-15 minutes, and each pulse behaved differently in terms of how much sound they generated. Information Contacts: Mark Belvedere, Kalia Foundation USA, 4515 SW Natchez Ct., Tualatin, OR 97062, USA (www.kaliafoundation.org); Treasure Island Eueiki Eco Resort, Vava'u, Kingdom of Tonga (www.tongaislandresort.com); Stuart Kershaw, In the Dark Productions (URL: http://inthedarkproductions.co.uk/); Sakopo Lolohea, Tongan Visitor Bureau, Ministry of Tourism. Vuna Rd., Nuku'alofa, Tonga (URL: http://www.tonga.holiday.com/). Tofua is a remote volcano in Tonga that is not monitored. The active Lofia crater, the largest and northernmost cone, appears to be undergoing a long-term, low level eruption, with spatter from a small vent containing lava, thin gaseous emissions, and an infrequent plume (BGVN 36:07 and 36:09). This report covers activity since our previous reports in July and September 2011, enumerates thermal alerts since April 2009, and quotes part of a blog published in 2005 by a traveler to Tofua that was not previously included in our previous reports. During 13-14 August 2012, the Wellington Volcanic Ash Advisory Centre (VAAC) issued several volcano ash advisories, based on a pilot report and subsequently confirmed by the Tongan Meterological Service. Apparently, however, the advisories were triggered by a scrub fire that residents had set to flush out wild boars. A previous report (BGVN 34:02) listed thermal alerts through 6 April 2009. Since then, ten thermal alerts were recorded through 27 September 2013, listed in table 2. Table 2. Thermal alerts between 4 March 2011 and 27 September 2013. Thermal alerts are derived from data collected by the MODIS thermal sensors aboard the Aqua and Terra satellites and processed by the Hawaii Institute of Geophysics and Planetology using the MODVOLC algorithm. Courtesy of Hawaii Institute of Geophysics and Planetology. "We took about 2 hours to reach the summit of the island through a mixed terrain of jungle. When we got to the summit we set up camp again on a volcanic type surface which was really strange and nothing like I had seen before. Once we had set up camp we headed towards the active volcano walking around the rim of the island gaining some great views at the same time. The whole island had a great big lake in the middle of it with the old craters of extinct volcanoes and then the big one which was still active. We headed around the rim and down towards the active volcano. Once we got up to the active volcano which was a steep climb we could look right into the creator [sic] where we could see all of the lava below and smell all the gases coming out of the crater ...". Information Contacts: Wellington Volcanic Ash Advisory Centre (VAAC), Meteorological Service of New Zealand Ltd (MetService), PO Box 722, Wellington, New Zealand (URL: http://www.metservice.com/vaac/ , http://vaac.metservice.com/); Hawai'i Institute of Geophysics and Planetology (HIGP), MODVOLC Thermal Alerts System, School of Ocean and Earth Science and Technology (SOEST), Univ. of Hawai'i, 2525 Correa Road, Honolulu, HI 96822, USA (URL: http://modis.higp.hawaii.edu/); Earthquake Report (URL: http://earthquake report.com/); and STA Travel Blog (URL: http://blogs.statravel.com). The low, forested Tofua Island in the central part of the Tonga Islands group is the emergent summit of a large stratovolcano that was seen in eruption by Captain Cook in 1774. The first Caucasian to set foot on the 515-m-high island was Capt. William Bligh in 1789, just after the renowned mutiny on the "Bounty." The summit contains a 5-km-wide caldera whose walls drop steeply about 500 m. Three post-caldera cones were constructed at the northern end of a cold fresh-water caldera lake, whose surface lies only 30 m above sea level. The easternmost cone has three craters and produced young basaltic-andesite lava flows, some of which traveled into the caldera lake. The largest and northernmost of the cones, Lofia, has a steep-sided crater that is 70 m wide and 120 m deep and has been the source of historical eruptions, first reported in the 18th century. The fumarolically active crater of Lofia has a flat floor formed by a ponded lava flow. Bauer G R, 1970. The geology of Tofua Island, Tonga. Pacific Sci, 24: 333-350. There is no Deformation History data available for Tofua. There is no Emissions History data available for Tofua. Steam rises from Lofia cone on the north side of the caldera lake of Tofua volcano in this 1990 aerial photograph. Recent tephra from pyroclastic cone mantles the caldera rim to the NW. The walls of the 5-km-wide caldera drop steeply about 500 m. Three post-caldera cones were constructed at the northern end of a cold fresh-water caldera lake, whose surface lies only 30 m above sea level. Tofua was seen in eruption in 1774 by Captain Cook, and Captain William Bligh landed on the island in 1789, just after the renowned mutiny on the "Bounty." Aerial photo by Tonga Ministry of Lands, Survey, and Natural Resources, 1990 (published in Taylor and Ewart, 1997). Clouds almost entirely obscure the small island of Kao (lower-center) in this NASA Space Shuttle image, and a circular cloud pattern rises above the caldera rim of the larger island of Tofua (left-center). Kao is the highest volcano of the Tonga Islands, rising steeply to 1030 m about 6 km north of Tofua. No historical eruptions are known from Kao, and fresh-appearing lava flows are not seen, although the absence of sufficient time for erosion to produce deep gullies or high sea cliffs suggests a very recent origin. NASA Space Station image ISS008-E-14026, 2004 (http://eol.jsc.nasa.gov/). There are no samples for Tofua in the Smithsonian's NMNH Department of Mineral Sciences Rock and Ore collection. Large Eruptions of Tofua Information about large Quaternary eruptions (VEI >= 4) is cataloged in the Large Magnitude Explosive Volcanic Eruptions (LaMEVE) database of the Volcano Global Risk Identification and Analysis Project (VOGRIPA).